If you’d like to try vaping CBD oil and haven’t a clue how to get started, then this article is for you. We’ll take you through the ins and outs of vaping in general, we’ll discuss why you should opt for vaping CBD oil over other methods of consumption, and we’ll finish up by introducing you to some of the products available on HealthyHempOil.com before recommending a couple that are ideal for those of you who are new to vaping. Now, doesn’t that sound like a plan? Let’s dive in. 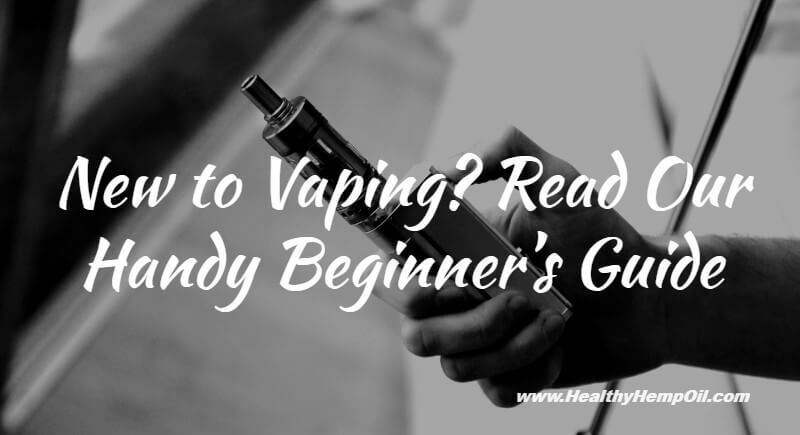 Vaping has established itself as a mainstream alternative to smoking traditional cigarettes. Instead of lighting a cigarette and inhaling a mixture of nicotine, tar, and smoke, an electronic cigarette or vaporizer is used to vaporize a solution of water, nicotine, and additional flavoring. Of course, other substances beyond nicotine can be vaped, which we will come to shortly, but it’s this movement from traditional cigarettes to e-cigarettes that has popularized the vaping movement in recent times. Typically, smokers have used vaping as a means of quitting smoking; rather than go “cold turkey,” they switch to vaping to receive nicotine without consuming the harmful chemicals that accompany cigarettes. It’s this reason in particular that led global sales of vaping products to exceed $6bn in 2015. The long-term health benefits of vaping are unknown, but opting to vape instead of smoking a cigarette has a number of plus points: for starters, you will no longer consume the harmful chemicals that make up a tobacco cigarette, including many known carcinogens; you will not expose your friends and colleagues to secondhand smoke; you will avoid the yellowing of teeth, fingers, and walls; and you won’t smell of smoke. Beyond those obvious benefits, vaping also means waving goodbye to exposing yourself, your family, and your home to one of nature’s most dangerous elements: fire. There is no combustion involved in vaping, which marks it out as a safer alternative to cigarettes before you’ve even put it to your lips. In other words, if you fall asleep vaping, you’ll wake up to a house that hasn’t been burned down (we hope). I’m New to Vaping CBD – Help! Nicotine is not the only substance that can be vaped. THC and CBD can also be heated and inhaled using a vaporizer. While consuming marijuana remains illegal in the United States, CBD products are legal and widely available. Vaping CBD means consuming a non-psychoactive and non-addictive substance. Typically, CBD is consumed orally as a liquid or capsule or applied as a topical ointment. This, however, comes with certain drawbacks – namely, the fact that the desired effects of the CBD can be somewhat delayed, and the absorption into the body can be inconsistent. Similar to THC, CBD will begin to evaporate at a temperature of around 200°C (392°F). This releases a gas that you will be able to inhale without the plant matter being burned. 200 mg was found to be the maximum dose of CBD that could be vaporized efficiently, according to a study conducted by a research team in Australia. The team found that higher doses of CBD resulted in a saturation effect. However, this point of saturation did appear to be related to the vaporizer and its ability to heat the oil efficiently. Choosing to vape over other methods of consuming CBD can be a big and intimidating step. This is mostly due to the fact that the vaporizers resemble e-cigarettes and can appear a little more complex than those alternative methods. That being said, using a vaporizer is probably the best, and fastest, way of consuming CBD. Vaporizers work by heating the CBD oil to the point where the liquid is transformed into a vapor, allowing you to inhale it. The CBD vaporizers are lightweight, elegant, stylish, and discrete. To begin vaping, you’ll need CBD vaporizers / CBD oils. There are two parts to this little device: the vaporizer itself, which you only need to buy once, and the refillable cartridges, which contain the CBD oil. The CBD vaporizers available on HealthyHempOil.com are rechargeable via USB, which makes them particularly convenient as you don’t need to change batteries; simply plug it in, and charge it up. The CBD oil present in the refillable cartridges is specially treated to be easily vaporized by the heat of the CBD vaporizers and provides the maximum benefit of CBD via inhalation. To help you get started, we’ve included a couple of recommendations below. Selecting these products is perhaps the most cost effective and easiest way to dip your toe into the world of CBD vaping. This vaporizer pen and cartridge set is ideal for those of you who are new to vaping. Simple to use, and effective, it is shipped with one CBD oil cartridge and a handy USB charger. It produces a smooth and full-bodied taste for a satisfying vapor. The USB charger makes for simple and easy charging of your pen. It’s lightweight and portable, so you can take it anywhere. You didn’t think flavored vapor was only for nicotine, did you? This tasty CBD vape oil is filled with the highest-quality all-natural ingredients, resulting in a full-flavored and full-bodied product. Lesser flavored CBD oils end up tasting like chemicals, but not this one. If you have a sweet tooth, you’ll find the strawberry particularly satisfying, and it’s also available in seven other flavors. Plus, it can be used to refill most 510 atomizers (like the Vape Starter Kit mentioned above)! Are you ready to try CBD vaping? Or do you still have questions? Let us know if you’re new to vaping CBD in the comments section.